There are many packaged specials at Christmas that are available for families, singles and group vacations in Las Vegas, Nevada. Airlines and hotels throw together many specials in package deals for vacations to Las Vegas, Nevada over the christmas season to bring in the tourists to see how this city spends the holidays. Once you have been to Las Vegas, Nevada over Christmas, you may return year after year due to the specials that are offered throughout the city and the Christmas lights that adorn the hotels along the strip. The city of Las Vegas makes Christmas an extremely special time of year and people find that it takes them away from the hustle and bustle of their home life. Lights are set up all through the city with special performances and events that relate to Christmas festivities. 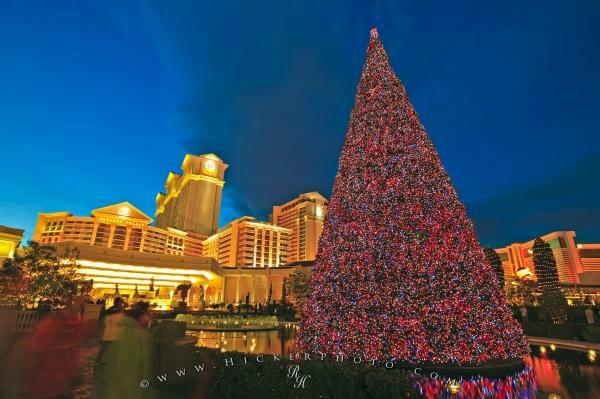 Photo of millions of special sparkling lights at Christmas time outside Caesar's Palace in Las Vegas, Nevada. ... The colors reflect in the calm waters along with the many decorated trees that line this waterway. Trees are not the only items decorated around town, as there are displays that blanket areas with artificial snow and animated products creating spectacular Christmas scenes. If you find Caesar's Palace to be an incredible display, continue on down the strip and take in the exhibits of lights at the other hotels. Las Vegas, Nevada is a place that is always illuminated with billboards and bright lights but that does not come close to how many lights there are at Christmas time. Each hotel puts out a tremendous amount of work in decorating at Christmas and the shops in the Caesar's Forum as well as the strip shops are filled with holiday specials. A trip to Las Vegas, Nevada is one Christmas that the family will remember for many years to come. I photographed this photo with the digital SLR camera model Canon EOS-1DS, aperture of f/11.0, exposure time of 1/0.166666 sec. on ISO 50, as always I used a original Canon Lens, the focus lenght for this picture was 18mm.